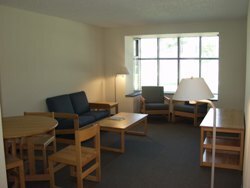 Located on West Campus, St. Clare Hall holds four residents per apartment in both single and double room occupancies. 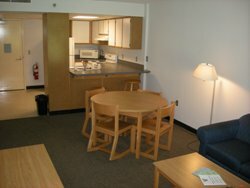 St. Clare Hall is one of eight apartment buildings that offers housing to upperclassmen. 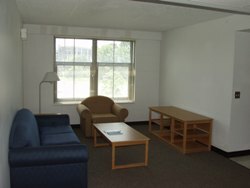 St. Clare Hall was named in honor of Saint Clare of the Cross of Montefalco. 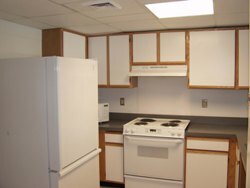 Kitchenette - contains a standard size refrigerator, a microwave, cabinets and drawers. Living Room - contains a sofa, a lounge chair, a coffee table, an entertainment unit and wiring for cable television. 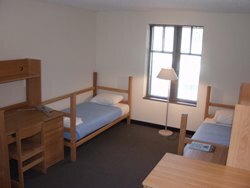 Bedrooms - single occupancy bedroom units contain one of the following in each bedroom: beds, dressers, desks, desks chairs, closets and wiring for telephone/computer jacks and cable television. 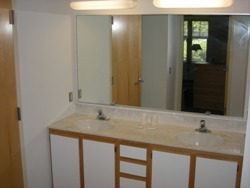 Bathrooms - two full bathrooms with showers and two sinks in vanity areas. Bedrooms - double occupancy bedroom units contain two of the following in each bedroom: beds, dressers, desks, desks chairs, closets and wiring for telephone/computer jacks and cable television. Bathrooms - two full bathrooms with showers and two sinks in vanity area. Closets do not have doors. Students often bring tension rods with curtains or shower curtains to block view of closet from the rest of the room. 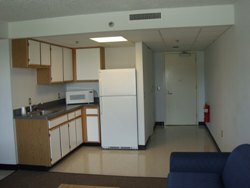 All Apartments are 2 bedroom units housing 4 students with the exception of:102, 105, 106, 115, 116, 119, 202, 205, 206, 215, 216, 219, 302, 305, 306, 315, 316, 319, these are 4 bedroom units housing 4 students. Showers in the larger bathroom in Farley, Gallen, Jackson and St. Clare are not standard size, the University will provide extra-long shower curtains for these showers. 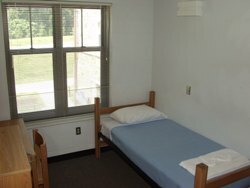 Students need to provide a shower curtain for the standard shower in the smaller bathroom.